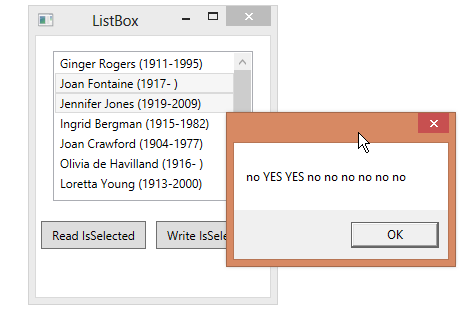 The ListBoxItem object, representing a single item in a ListBox, contains an IsSelected property that you can read in order to determine whether the item is selected. If you use data binding to populate the list, the objects in the ListBox’s Items property will not be ListBoxItem instances, but will have a type matching the bound object. You can use the ContainerFromItem helper method to get the corresponding ListBoxItem so that you can then query it to determine if the object is selected. As far as I remember this method works as long as the item is in the viewport or at least virtualization is not enabled. Trying to obtain the view item (that is ListBoxItem in this case) for a virtualizing ItemsControl (ListBox in this case) which is not in the view port will usually yield null. As far as I remember if virtualization is enabled and the item is not in the view port, ContainerFromItem will yield null. Are you sure this works with virtualization? … and as far as I experimented just now (.NET 4.5) virtualization is on by default.